involvement and interest among young men and women in this country. 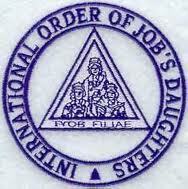 Job’s Daughters International is an international organization for girls who are related to a Master Mason. Young women who are between 10 to 20 years old and have a relationship to a Master Mason or who are daughters of Majority Members may join this group. While Job’s Daughters is not part of the Masonic Fraternity, this eligibility requirement creates a close bond with the Masonic Order.